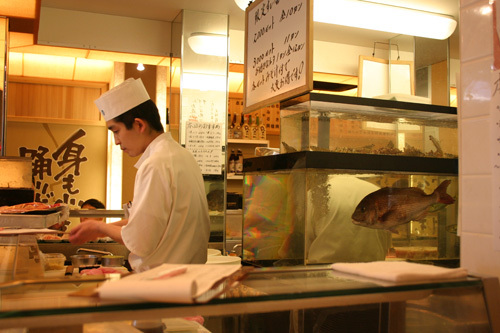 Of course, seafood is not the only thing that’s sold in this gigantic market. 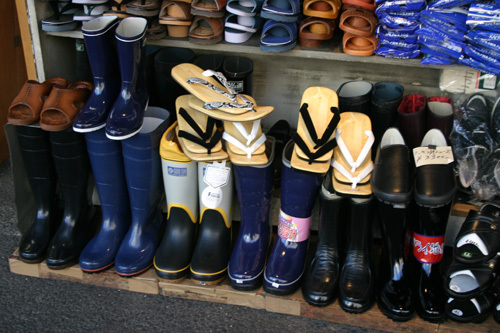 You can buy just about everything seafood related around there, rubber boots, for instance. 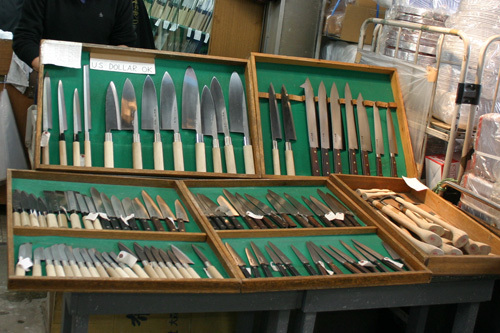 There are a lot of knife merchants around that sell mostly Japanese-style knives. I already have a decent set of Japanese Deba Hocho knives, but I just had to buy a souvenir gaff, a miniature version of a hook that everybody in the market used to grab boxes and fish (they are on the right of this display box. Here’s a merchant sharpening a knife on a waterstone. I have one of those too. Because of their single-sided concave edge, Japanese-style knives are significantly sharper and easier to sharpen than Western knives. Still, getting a really sharp edge is a bit of an art. There are numerous food stalls around the market. 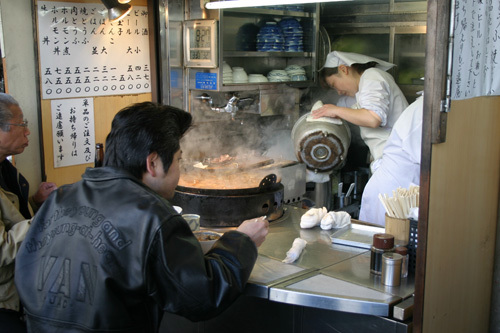 Here’s one of the cooler ones, with a giant steaming pot of something and a dude with a yakuza-like pompadour haircut. This was one of those few places in Japan that refused to serve us, gaijin. Instead, we went to a sushi place with slightly disturbing decoration: a doomed fish in an aquarium that watches you as you eat. The sushi was very fresh and reasonably priced, but not significantly better than what I am used to in New York.